Upper Canada College was founded in 1829 by Sir John Colborne, the lieutenant-governor of Upper Canada, who later became Lord Seaton. A distinguished statesman and military leader, Colborne fought in both the Revolutionary and Napoleonic wars. UCC was one of the first institutions for secondary education in the province. The intention was that UCC would serve as a feeder school for the newly founded King’s College (later the University of Toronto). UCC was modeled after the great public schools of Britain, most notably Eton College. To this day, UCC maintains a link to the royal family through Prince Philip, the Duke of Edinburgh. He acts as a special visitor. The College was originally located on King Street and then Russell Square in downtown Toronto. UCC moved to its current site, the Deer Park campus near Avenue Road and St. Clair Avenue West, in 1891. The city didn't extend north of Davenport Road at that time and the school was located in rural surroundings. During its first year of operation, 1830–31, UCC admitted 140 pupils and employed a principal and eight masters (teachers). The College now has about 1,100 students, more than 110 teachers and 125 staff. 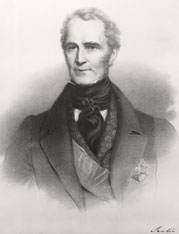 Sir John Colborne founded Upper Canada College in 1829.